Thank you for your interest in our upcoming Miss Wisconsin Scholarship Pageant. Ticket sales are currently for PREVIOUS PURCHASERS ONLY, Gold, Silver or Patron packages. To retain those previous package seats they must be purchased by March 16, 2019. After the March 16, 2019 deadline ALL unsold seats will be available for purchase to the general public. Note: If a package purchase is made by someone prior to March 17, 2019, who is not a previous package purchaser, that order will not be processed until after March 17, 2019. General ticket sales will be begin online on March 17, 2019 and be available for purchase online through June 8, 2019. Tickets can be purchased by anyone through the Miss Wisconsin website. Online ticket sales are not available after June 8, 2019 and can only be purchased at the box office before each night of competition. Tickets will be mailed once tickets are printed and received from the printer. Mailing ends May 26, 2019. Any tickets purchased after May 26, 2019 will not be mailed and will be available for pick-up at the Will-Call table at the auditorium. PLEASE NOTE: Gold Patron Packages are SOLD OUT! Location: Alberta Kimball Auditorium in Oshkosh, WI. Click here for directions. As a reminder, all seats for Friday’s Outstanding Teen show are unreserved. 1. Everyone, including infants, must have a ticket for admission. 2. Priority is given to Gold/Silver/Patron package orders. To order these seats, consult the chart for available seating. 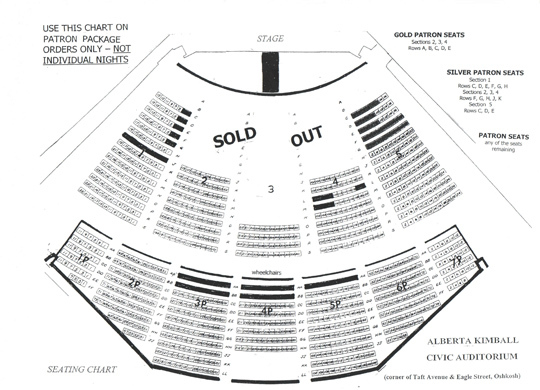 The sold out and blocked rows are unavailable except as reorders by the pageant patrons who have held those same seats for numerous years. Open seats will be sold according to the date that the order arrives. 3. *Online, You can note previously ordered seat numbers in the Special Requests field. If you are not ordering previously purchased package seats exact seats if requested are not guaranteed. Every attempt will be made to keep you in the section you have requested. 4. *Mail-in, circle your choices of available patron seats only on the seating chart and return it with your order form. Exact seats are not guaranteed though every attempt will be made to keep you in the section you have requested. 5. If people wish to sit together, tickets must be ordered at the same time and all seats should be the same package type. We cannot guarantee requests for seating with a specific group if tickets are ordered separately. 6. Please note on your online or printed ticket order form if a ticket is for someone confined to a wheelchair or has handicap needs. 7. For ticket sales to the general public you will get the best seats available, based on the date your order was received. Specific seats cannot be honored for individual night tickets, especially Saturday. Please disregard the seating chart. 8. Ticket will not be saved or reserved. Full payment must be received with your order form or it will not be processed. 9. Once tickets have been mailed, there will be no refund or exchange. 10. The Miss Wisconsin Organization is not responsible for lost or stolen tickets. Print, complete and send our Mail in Order Form with payment to order your tickets by mail. Gold Patron Packages are SOLD OUT!